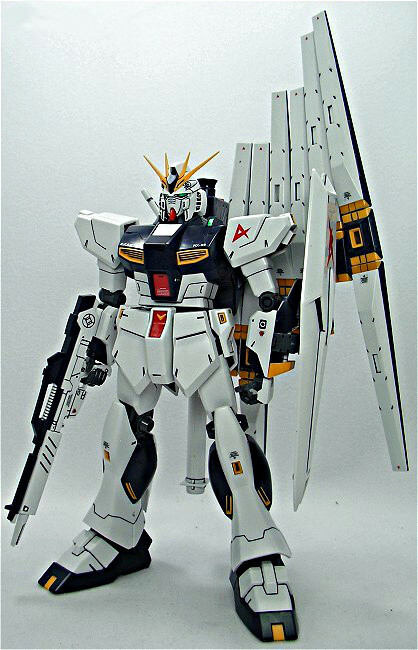 The RX-93 Î½ Gundam Double Fin Funnel Type (Nu Gundam Double Fin Funnel Type) is a Mobile Suit piloted by the main character, Amuro Ray. 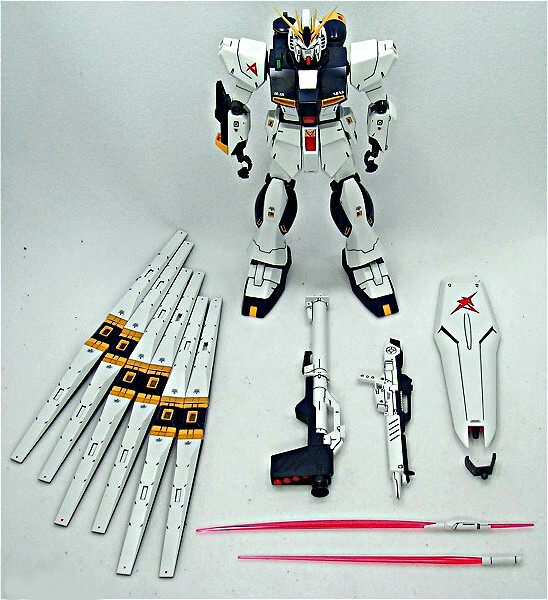 It first appeared in Char's Counterattack Mobile Suit Variations. In response to the rise of Char Aznable's second Neo Zeon movement in the early UC 0090s, the Earth Federation Forces create a special task force called Londo Bell to investigate and stop the new rebellion. One of Londo Bell's mobile suit pilots is famed One Year War ace Amuro Ray, whose Newtype abilities are essential to stopping Char's forces. Londo Bell commissions Anaheim Electronics to build a new Gundam-type mobile suit for Amuro's use, incorporating the latest in psychic communication technology. 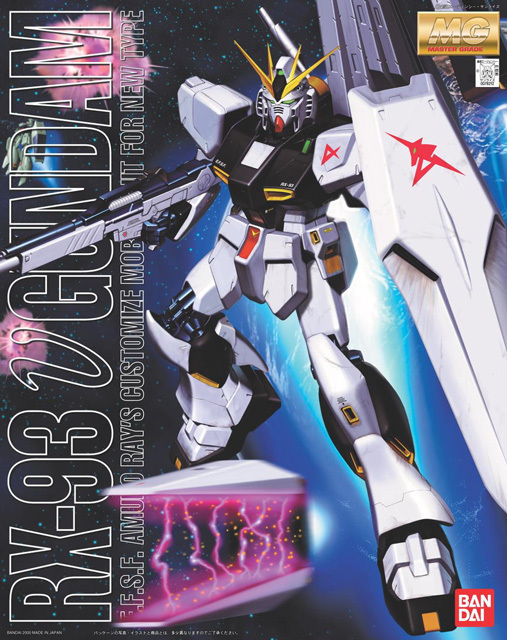 Anaheim's result is the RX-93 v Gundam (v being the Greek symbol "nu"). 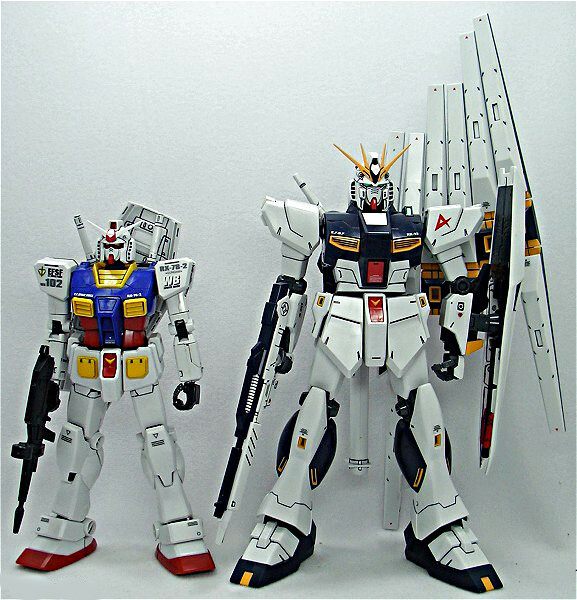 The v Gundam's basic design is created by Amuro himself, but construction and final modifications are supervised by Anaheim engineer October. October incorporates the latest piece of psychic communication technology - supposedly leaked to Anaheim by Char's Neo Zeon - called the "psycoframe." Composed of microscopic-sized psycommu receptor chips, October incorporates the new psycoframe technology into the v Gundam's cockpit frame, not only reducing its total weight but giving the pilot an edge in being able to more easily read an enemy's thoughts and movements. However, Char's forces begin to move quickly, and the final rollout date for the v Gundam is moved up. Amuro takes possession of the v Gundam and returns to the Londo Bell task force to prepare his new mobile suit for the coming fight with Char. Unfortunately, the psycoframe advantage also has its drawbacks. October warns Amuro that the psycoframe can create "powerful unknown phenomenae," and this proves true when Amuro attempts to use the v Gundam to single-handedly stop half of the asteroid base Axis from falling on Earth. When other mobile suit pilots join in the effort to push the giant rock from its decaying orbit, the concentration of so many minds on a single task causes the v Gundam's psycoframe cockpit to overload, resulting in the mobile suit's destruction... and Earth's salvation as Axis is pushed away by the overwhelming psychic force. 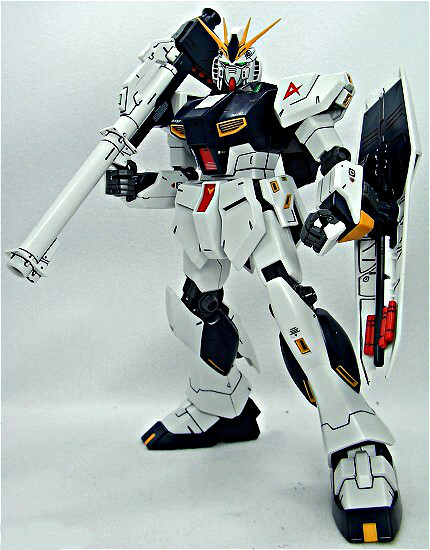 Psycoframe development continues after the war, and in UC 0096 the Vist Foundation rolls out the RX-0 Unicorn Gundam, a mobile suit that incorporates the psycoframe throughout its entire body. 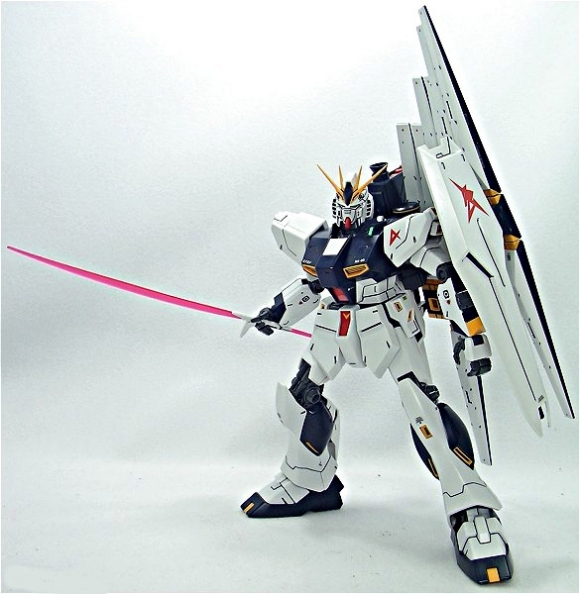 Fin funnel - Along with the psycoframe, the v Gundam is also equipped with six "fin funnels," a new evolution in Newtype-controlled remote weaponry. Although they are technically "bits" and not "funnels" (since the fin funnels have their own onboard reactors for power), they are far more advanced than normal bits or funnels in that, in addition to serving as remote beam weapons, they can also be used in geometric formations to create a "beam barrier", offering a target 360 degrees of protection against most weapons fire. By combining these advanced remote weapons with a Newtype pilot's psycoframe-enhanced abilities, the v Gundam proves to be an unstoppable foe for the common Neo Zeon pilot.